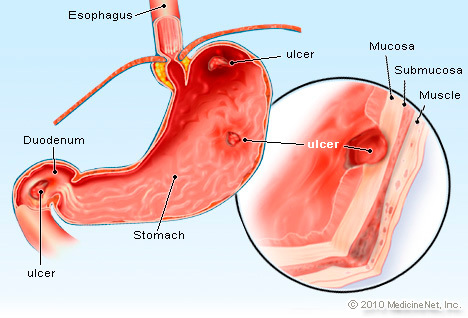 What are Peptic Ulcers (Stomach Ulcers)? Peptic Ulcer disease refers to painful sores or ulcers that are on the lining of the stomach or duodenum, the first section of the small intestine. There is no single known cause for the developing ulcers. However, it is clear that an ulcer develops as the result of an imbalance between the duodenum, which is the first part of the small intestine, immediately next to the stomach. Digestive fluids in the stomach. However, most ulcers are caused by an infection from Helicobacter pylori (H. pylori) bacteria. The use of painkillers, known as nonsteroidal anti-inflammatory drugs (NSAIDS) including naproxen( Anaprox Aleve, Naprosyn) aspirin and Ibuprofen(Advil, Motrin, and Midol). There are several other that are available through prescription. Safety coated aspirin, and powdered form aspirin commonly are a reason for ulcers. Zollinger -Ellison syndrome Gastronomic, tumors from the cells that produce stomach acids increases output. Serious Illness of some type. Are there any Symptoms for A Peptic Ulcer? Taking NSAID can lead to ulcers without warning, especially elderly individuals and those with a history of having peptic ulcers. Who are at higher risk to get Ulcers? Have liver, kidney or lung disease. How do doctors diagnose Ulcers? Your doctor may be able to determine fi you have an ulcer just by asking you questions about you symptoms. In order for a doctor to confirm the diagnosis, there may be several test that need to be done. The first thing your doctor may ask is acid blocking medication such as heartburn for short time frame until symptoms improve. Your doctor may recommend that you undergo an upper endoscopy, involving inserting a small lighted tube called an endoscope, through the throat into the stomach for abnormalities. This procedure is usually done if you have severe recurring symptoms. However, it is possible for a doctor to begin treatment with coming with an endoscopy. If ulcers are not adequately treated, it can lead to serious health problems. There are different ways to treat her ulcers, by making changes in your lifestyle, taking medication and undergoing surgery. The lifestyle changes that can be done include stopping smoking and drinking alcohol. If you are taking NSAID, it is best that you stop taking those as well. Antibiotics for H. pylori infection, some antibiotics help remove the infection. The multiple combinations of antibiotics that take one or two weeks with PPI, Bismuth is as part of some treatment regimens. Upper endoscopy – helps repair building ulcers. Surgery sometimes is needed to repair cellular damage, if there is bleeding that can be controlled with an endoscope. You should contact health care provider if you are experiencing any of the symptoms.